Sitting at the heart of the Emerald Coast in Fort Walton Beach, the Pirates Bay Condos are one of the best kept secrets of the Emerald Coast. These bay side condo’s overlook the 700 foot Lazy River Lagoon pool. Float around the lazy river or take a dip in the 4900 square foot pool. The resort also includes 2 Gulf side pools, a zero entry pool for the kids and 3 huge hot tubs. 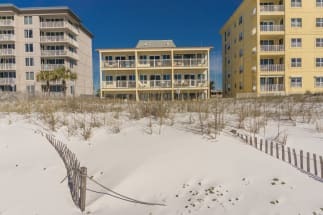 The resort provides a short walk-over to the sugar white beaches of the Emerald Coast and a fishing pier just a short stroll away. There are several restaurants in the area, some of the local favorites include Stewby’s Seafood Shanty, Floyd’s Shrimp House and Angler’s Beachside Grill. Pirate’s Bay provides all things needed for a relaxing and fun filled family vacation. Book your next trip to Pirates Bay with Emeraldcoastbyowner.com. Our owners will surely help you plan your stay and you will not pay any service fees. We hope you enjoy your stay at Pirates Bay!